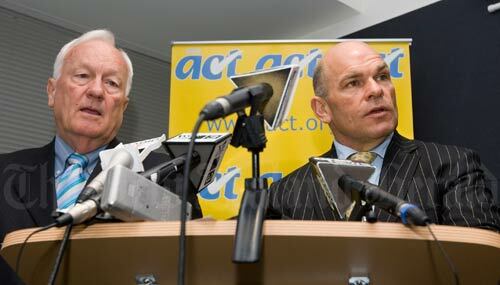 ACT founder Roger Douglas (left) returned to the party in 2008, and is seen here with then party leader Rodney Hide launching the party’s policy prior to the 2008 election. Douglas had been minister of finance in the 1984–1990 Labour government, and its economic liberalisation, corporatisation and privatisation of some government departments and agencies became known as 'Rogernomics'. Unhappy at what he saw as a failure to complete the process, Douglas left Labour and, with another ex-Labour cabinet minister, Derek Quigley, set up the Association of Consumers and Taxpayers in 1993, and initiated ACT New Zealand, a political party, in 1994, with Richard Prebble (another ex-Labour cabinet minister) as leader.